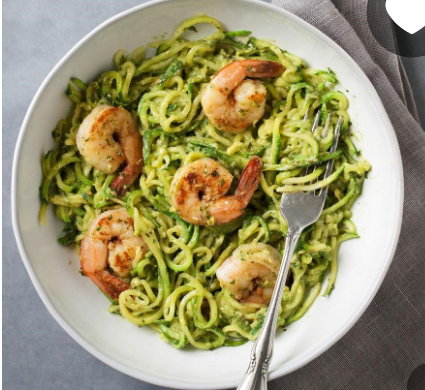 Zucchini noodles with avocado pesto shrimp sounds so divine with all the zucchini I’m trying to grow in my garden. And shrimp is a lovely protein for warm summer evenings. This recipe calls for pistachios to make the pesto. You can make a more classic pesto with pine nuts. I also love using raw walnuts in my pesto. It provides a flavor that reminds me of warmth and love. Every November, my mom would set out a nut bowl with walnuts and hazelnuts so we could just have a few nuts when we walked through. I love filberts, make no mistake. But there’s something about a raw walnut that’s so, oh I don’t know, perfection. I confess to being a nut for nuts. And I do say to look for unsalted nuts for this recipe. 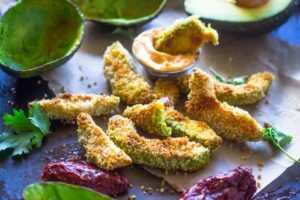 The avocado pesto would be way too salty otherwise. But back to the topic. You could also use bay scallops (the little guys) in this as well for a delicious dinner. Avocado pesto is a great way to make a creamy sauce with healthy fats. Now, don’t get me wrong. Olive oil is super healthy too. I’d probably also add in more herbs like cilantro or flat leaf parsley. Flat leaf parsley has a different flavor. Try growing some and you’ll see what I mean. I’m a huge fan of growing something..anything…just to get in touch with the growing life cycles. But I digress. You can eat this on its own or have a crisp salad with it. I’d also think about adding in halved cherry tomatoes for a burst of acid and color.